Electric feed pellet mill has a wide application in breeding industry all over the world, mainly because of its superiority over other similar flat-die pellet presses. 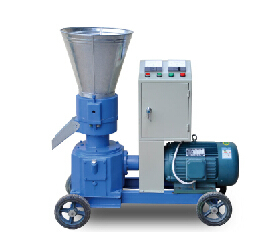 Feed pellet mill driven by electric motor is cleaner, and more convenient. And it can meet the electrical requirements of customers from different regions. Moreover, the electric motor can be packed half or totally in the cabinet to ensure security of the operator. Of course, electric pellet mill can also run smoothly even without cabinet's coverage. The electric pellet mill is perfectly suitable for both home and individual usages, with large enough pellets output capacity. The machine can make biomass pellets and feed pellets. Besides, it can also make bedding pellets from cardboard for animal stalls, especially horse stables. For biomass pellets, the common raw materials are: wood chips, sawdust, corn stalks, corn cobs, grass, leaves, bean stubble, switch grass, straw, dry distillers grain (DDG), seed hulls, alfalfa, cardboard, forest waste, bagasse and paper. Raw materials for making feed pellets are: corn, maize flour, soybeans, soybean meal, fish meal, animal acid, whey power, meat and bone meal, additives, and sweet sorghum, etc.